Darren Excell (10) powered home to win the 2002 Davies Cup for 50m Butterfly at the South West Sports Centre yesterday. Swimming in lane 2 off a handicap of 25 seconds, in the last few meters he overtook Tom Castieau - who seemed to have the race in the bag - to win by two seconds, in a new PB three seconds faster than he set in the heat swim. Tom Castieau (11) took second spot, taking 9 seconds off his previous time before the meet, and Peter Castieau (15) finished third. Trophy donor Mrs Jean Davies was on hand to present the Cup. 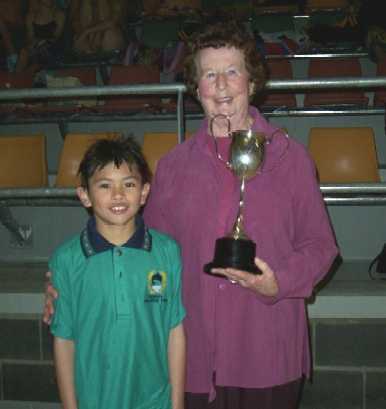 The next trophy swim is the Ian Osborne Trophy for 200m Individual Medley.